A spa can be built in a variety shapes and sizes. With custom spas being made of gunite, your design options are limitless. It is also very easy to integrate decking and landscaping around your spa to bring your ideal vision to life. When you opt to build your spa without a pool, you can expect an expedited construction schedule. You can also incorporate water features and other aesthetic elements like stone and tile to enhance your spa. While you may hear the term “inground” when it comes to your spa, it can also be built in an elevated position. In addition to shape and size, you can also determine the number of seats, steps, jets, configuration, and more. When it comes to portable hot tubs, you are beholden to the standardized molds and specifications produced in a factory. The gunite construction of your custom spa also offers unparalleled durability. 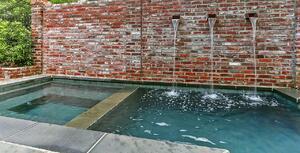 Lucas Firmin Pools designs and builds custom pools and spas in the Baton Rouge area. If you are ready to add to your backyard with your own custom spa, this expert team can make your vision a reality.